In April of 2016, while I was scrolling through instagram, I saw a rescue group looking for a foster to take in this young little mama dog. She was about to give birth to an unknown number of pups. I had only just started fostering a few months prior, yet I couldn’t help but feel my heart tug for this poor mama who had been dumped in the shelter to no fault of her own. I was on the phone with the rescuer less than ten minutes after I first saw that post. That call changed everything for me. 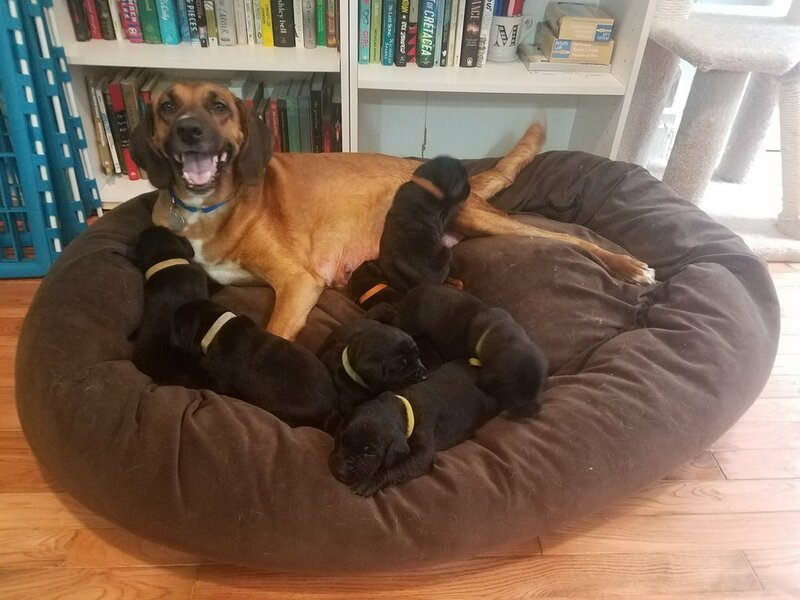 Since that first mama, I have taken in five mama and pups litters, as well as three other smaller litters without mama, each one leaving me with a new story to tell in just under ten weeks. There weren’t many other fosters parents that I could turn to at the time, and I have become obsessed with providing support to other foster parents who are considering doing the same to make the time feel a lot more manageable. Mama does it all. Even a first-time mama has her instincts kick-in and she goes straight into mothering mode. For the first four weeks, she feeds them, bathes them, and even eats their poo and slurps their pee (yes, you read that right). You will only need to go in to their area to change their blanket as often as needed. I also recommend weighing them from birth and then weekly (or daily if there are any inconsistencies or medical concerns) just to be sure everyone is in the same weight range and gaining at a similar pace. They aren’t really mobile until about 5 weeks old, making them really easy to be contained in one pen area with just mama coming in and out to eat and go potty. Depending on the size of the litter, you can confine them in a large crate, upgrading them to a playpen once they start to run around. You don’t need to be home all day to care for this many pups. While mama is doing everything for them, she will be drinking and eating more than normally, so she’ll need frequent potty breaks (short though- no vigorous exercise in the beginning), unlimited access to water and lots of food to be happy. Once puppies are older, they entertain each other by learning how to play and someone will only really need to be there for clean up and feeding times, every 4-6 hours. It’s not as messy as you imagine. Because the pups are going potty on mama for the first 5 weeks, you won’t need to deal with pee pads and such until weaning begins. I’ve also found that when the times get tough, posting in the Facebook Foster Forum will get so many replies because most people will opt to help clean for a bit, and then enjoy a good puppy cuddle. These aren't the puppies that will chew up your books, shoes and furniture. They can't! Even when their teeth finally develop, they don't have that “puppy energy" that we've all come to know and love until about 7 weeks old. Pups under 7 weeks of age spend most of their time sleeping and eating, with short play sessions with each other and then back to sleep. The time goes by so quickly, and in what feels like no time at all you will have saved the lives of an entire family from their fate. There is no greater reward. Want to learn more about fostering a litter of puppies and/or a pregnant mama dog? Complete the Contact Form on our site, and Puppy-Raising Foster Expert Maria will be in touch!